Mellifont Abbey in County Louth is one of the most interesting if inconspicuous (at first glance) abbeys in Ireland. The Cistercian Order was founded in 1098 in Citeaux in what is now France. While its foundation is complex, essentially it was a reaction against the perceived corruption and extravagance of the older Benedictine monasteries like Cluny. The aim of the Cistercian Order was to return to the original ideals of St Benedict and to live a very simple life. Cistercian abbeys were usually isolated and self sufficient, though the lay brothers did the work on the farms because the monks were cloistered. They lived simply and ascetically, closely following the rule, away from the gold, excesses and luxuries often seen in the bigger older monasteries. They also deliberately founded daughter houses. By 1153 over 350 houses had been established across Europe, including Mellifont. This was at least partly due to the work of the man who is probably the best known Cistercian of his period; Bernard of Clairvaux. Bernard is not one of my favourite historical figures, largely due to his puritanical opposition to Eleanor of Aquitaine when she was Queen of France. He was, however important. He joined the Cistercian Order as a novice in 1113 and by 1115 was the founding abbot of one of the early daughter houses in Clairvaux. He preached the 2nd crusade, was a councillor to Louis VII and had an immense amount of influence. He died in 1153 and was canonised by 1174. 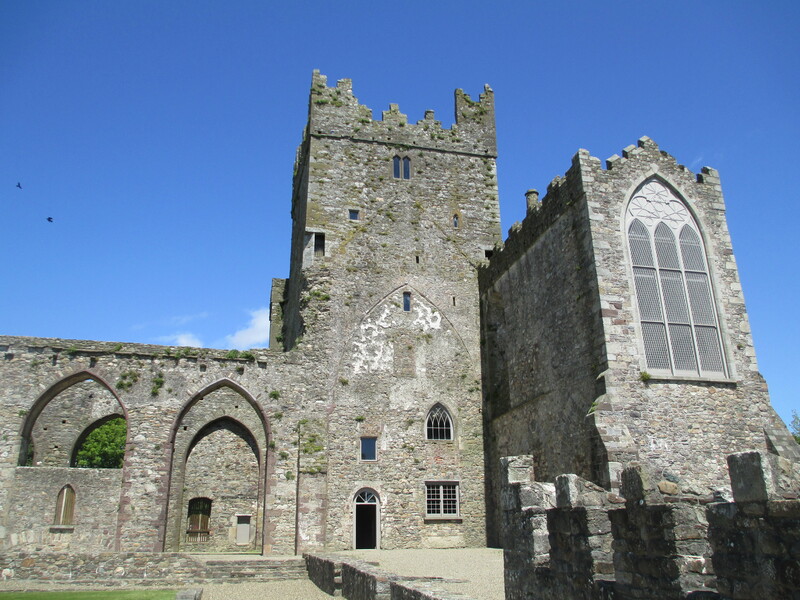 It was Bernard’s friend St Malachy who founded Mellifont Abbey. He was granted the land by Donnchadh Ua Cerbhaill, King of Airghialla. It was founded with roughly 300 monks and 300 conventuals. The church in the abbey was consecrated in 1157. The remains of part of the transept can be seen below. The foundation was part of a general re-evaluation of christianity in Ireland. There were several Synods leading up to Mellifont’s foundation in 1142. Furthermore the Cistercians were only one of a number of continental orders that arrived in Ireland at around the same time. Mellifont might have been the first Cistercian abbey in Ireland, but it certainly wasn’t the last. It was the mother house for at least 8 daughter houses by 1153, including Boyle Abbey which was founded in 1148. The church of which can be seen below. 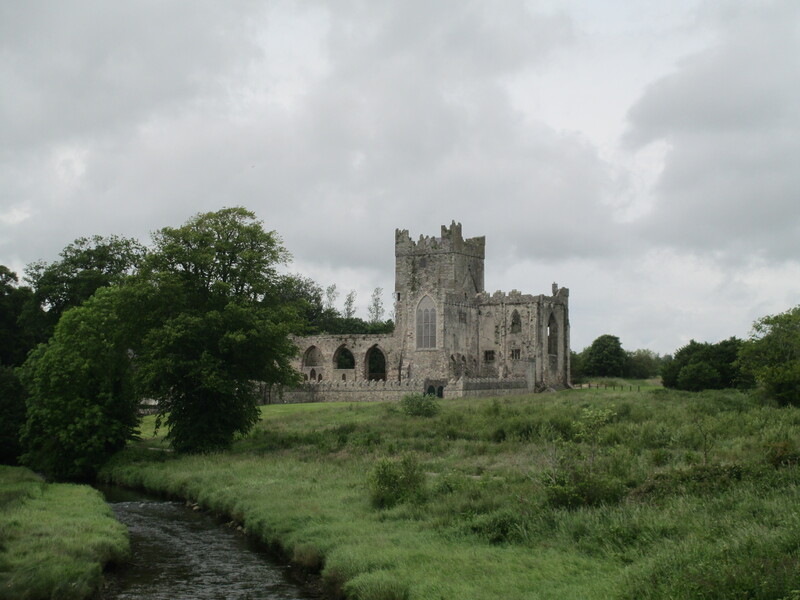 The Cistercian Order spread quickly, partly because of Ireland’s landscape, which worked well for the Cistercian model of isolated self-sufficiency. The abbeys were also supported by the incoming Norman-French/ English nobility who came to Ireland in c.1170. Many of the Cistercian abbeys can be found in parts of Ireland that were under Norman control by 1200. 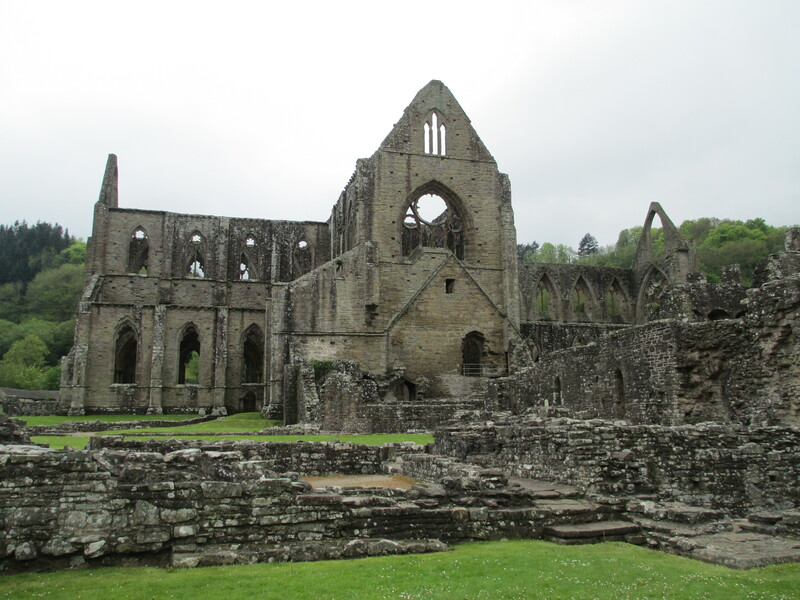 An example is Tintern Abbey which was founded by William Marshal. Marshal came to visit his lands in Ireland that came to him by right of his wife Isabel de Clare in 1200-1201. They were caught in a terrible storm crossing the Irish Sea and Marshal vowed to God that if they survived he would found an abbey. The ship didn’t sink and Marshal kept his word. As thanks to God for their survival he founded Tintern Abbey, which stands on Hook Head Peninsula. It’s known as Tintern of the Vow as well as Tintern Parva, meaning small Tintern in Latin. It can be seen below. As you can see from the photos of other surviving Cistercian abbeys there is comparatively little left at Mellifont. It, like many other abbeys, was a victim of the Dissolution of the Monasteries in the 16th century. Following the Dissolution the buildings came to Sir Edward Moore who converted them into a fortified residence. It played a role in several Irish wars and during the Battle of the Boyne in 1690 King William based his headquarters there. It fell into disrepair in the early 18th century and eventually ended up in the hands of the state in the 1880s. Despite that lack of large buildings remaining there are some fascinating surviving features. The one most people notice is the lavabo which dates to the beginning of the 13th century and would have been where the monks washed before entering the refectory. You can see it in the photos below. It is an unusual survival partly because it was octagonal. Additionally much of the intricate stone work has survived and can be found preserved in the visitors centre. Examples can be seen below. My favourite survivals however are the medieval tiles. I’ve written about medieval tiles before and that can be found here. The tiles at Mellifont aren’t in the original positions and they are kept in formation in a closed off area because they were damaged by vandalism. They were most likely first introduced to Mellifont sometime after 1230. Intricate patterns adorn the tiles. They represent roughly 10 or 11 of the common medieval tile designs. You can see examples of surviving tiles below. Most of these tiles were discovered during an excavation in the 1950s. The overall evolution of Mellifont Abbey architecturally was key to religious architectural development in Ireland generally. It would have possessed some of the most dramatic and beautiful church buildings in Ireland. By 1540 Mellifont held estates that extended to 50 000 acres making the abbot one of the wealthiest landlords in the country. It was remodelled on several occasions and it is likely that other religious buildings across Ireland would have been based on its design. The photo below is a model which shows how the abbey itself might have looked at the height of its powers. Mellifont benefited from the support of many noble families including local Irish nobility, especially in its early years before the Norman conquest. For example Dervogilla, who was the wife of O’Rourke of Breffini, gave a gold chalice for the altar and furnishing for nine other altars as a gift for the consecration of the church in 1157. Only a little before this gift Dervogilla had, unwittingly, become one of the key sources in the Norman invasion of ireland. Diarmait Mac Murchada was King of Leinster. He was involved with the other kings of Ireland in various disputes and battles. In 1152 during yet another conflict he carried off Dervogilla, who was the wife of his old enemy O’Rourke, and her cattle. Depending what source you believe she may have been consenting as her husband was a bit of a tyrant. This abduction was a personal insult to O’Rourke and he held a grudge. Although O’Rourke managed to reclaim Dervogilla, a little over a year later, he never forgave or forgot Diarmait. His grudge helped to lead to Diarmait’s loss of his kingdom in 1166 and his subsequent request for help from Henry II, which brought the Norman/French to Ireland in 1169. The never left again. Dervogilla may have stayed with her husband after being reclaimed, but as well as Mellifont she had the Church of the Nuns at Clonmacnoise built. You can see some of Clonmacnoise in the photo below. Dervogilla retired in 1186 to Mellifont and she died there. It is possible that she was buried in the wall of the church and legend has it that she was buried the wrong way round because she was a “fallen woman”. Mellifont Abbey was at the core of faith in Ireland from its foundation in 1142 until its dissolution in the 16th century. It shaped the way religion was enacted in the country and it shaped the development of many other religious houses. For what now, especially in comparison to other sites, seems to be a small and inconspicuous grouping of walls and buildings it is of national historical importance. Site visit to Mellifont, Boyle, Clonmacnoise in 2015. Site visit to Tintern Pava in 2012 and 2015. Site visit to Tintern 2012. Special thanks to Lindsay from OPW at the site who answered all my questions and showed me the tiles.